On 7 May 2014 I found a slightly odd looking female shrike that looked like an Isabelline Shrike type on my local 'patch' that had a couple of hybrid type features also. It had a darker tail and whiter looking outer tail feathers than normal but darker areas in the tail can be quite evident in some Isabelline Shrikes and a pale margin to the outermost tail-feather is also normal. However, in Isabelline the pale margin is creamy rather than white (as in collurio). 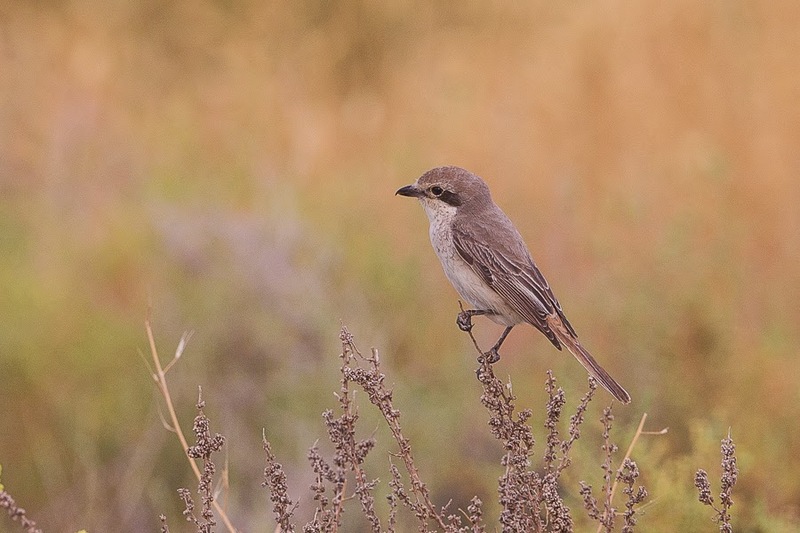 The quite saturated brown component in the hue of the upperparts and the well-marked dark chevrons on the underparts (including an obvious scaly ‘malar’) are a better match for Turkestan Shrike than Daurian Shrike (as perhaps is the all dark bill) but the throat and lower cheeks would normally be whiter in Turkestan Shrike. There is a lot of variation in females (and first-winter) Turkestan and Daurian Shrikes and, although some ‘classic’ individuals can be distinctive, many are not and assigning passage individual females and immatures to form is quite tricky and often best left unassigned. Even more difficult can be excluding the possibility of some hybrid influence. While ‘mixed’ characters are usually quite evident in adult males, the same cannot be said of females and immatures. All the ‘confidently’ assigned hybrids in the literature are males and I’m not aware of any females or immatures that have been confidently assigned (e.g. some purebred female and imm collurio can have quite obvious rufousy hues in the tail). I thank Alan Dean for his very useful comments on this bird.